Portland State traveled to Eugene on Monday night, and they lost 79-70 to a solid Oregon team. After coming back from a deficit to cut the lead to as little as three, they just didn't have enough to get over the hump to secure what would have been a huge road win. Michael Harthun hit a three from the deep corner with 1:25 to play and it was 71-68. 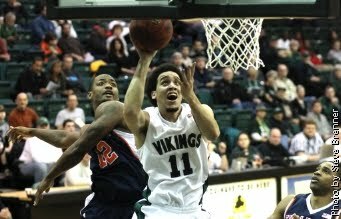 Then, Oregon's Devoe Joseph responded by hitting a tough, driving shot to hold the Vikings off. "That was a tough shot. I thought we played pretty good defense. We just needed to get one stop. We get one there and the game changes," said Head Coach Tyler Geving. The Vikings had four players in double figures, led by 16 from Chehales Tapscott. But they couldn't overcome too tough performances from their stars. Charles Odum shot just 4/13 from the field, uncharacteristic for him because he is a very efficient player. Big man Nate Lozeau also struggled to get anything going, finishing with 4 points and 5 rebounds before fouling out. Portland State will have no time to stew over this game, as they have a big home one against Cal State Bakersfield on Thursday. The Vikings still sit at 5-4, but they don't have a lot of impressive wins. Winning on Thursday would be a really nice one for them to get.